When it comes to speed, fast is never fast enough (for some speed demons). I personally love taking my ATV out to an abandoned field and letting that baby rip up to 70+mph. (As fast as it can go.) With this theory applied to eSk8s, let’s take a look at 5 high-speed electric skateboards that really get your juices going. You’ve seen the Swagtron name before and with good reason. They’re a serious force in the electronic transportation industry, and are not a brand to take lightly. Especially considering that their “monster” Voyager e-Longboard is one of the beastiest boards you can buy. Not only does it travel 15 miles in single charge (which is respectable), and not only does it carry up to 330lbs… weighing itself only 19 lbs… but it’s made with EIGHT layers of Canadian Maplewood and two layers of bamboo. The deck on this thing explains why I call it a downright monster. Here’s the “cherry on top” (and the reason you’re reading): for everything this eSk8 has, it BLAZES up to whopping 30mph. Here’s something about Koowheel’s D3M Longboard eSk8 that’s just beautiful: it has 2 battery packs. A lot of boards have only one battery pack. What this means is that you can travel an incredible 37 miles total. Koowheel did something unique and different in the electric skateboard industry. They gave their D3M e-Longboard two speed modes – depending on how you want to ride it. The first one is a bit above average speed when it comes to eSk8s: 18mph. If you’re ready for some REAL fun, the second (and better) mode blasts you past 27mph. (NOTE: On Amazon.com, a few reviewers reported that the electrics disconnected after a few riding sessions. “Scott” suggests people save up for a better board, as his unit flung him off the board and the wheels started smoking. Buffalo’s F e-Sk8 comes in three speed modes: beginner, cruise and advanced. Beginner and cruise modes are 11mph and 12mph, respectively. That’s a little below average top speeds, but hey: those are beginner and cruise modes. You can’t hate Buffalo for making speed modes designed for almost everyone. Let’s get something else out of the way: Buffalo made their F skateboard deck using 4 layers of bamboo and 4 layers of fiberglass – two of the most indestructible materials available today. What’s even more impressive is the fact that the board altogether weighs only 17 lbs. If you want fast, E-glide has your back (and they really do). Their GT Powerboard shoots you from zero to 23mph in a “five second performance.” Whether or not those five seconds is true, zooming up to 23mph from a still position is VERY impressive. E-Glide has been able to conquer this tremendous type of thing because they’ve been in the “electric transportation” business for 11 years. In that time they’ve also managed to manufacture electric bikes (which are becoming all the rage). They make three classes of eSk8s: the GT Powerboard (Aluminum and Anodized), and A/T. 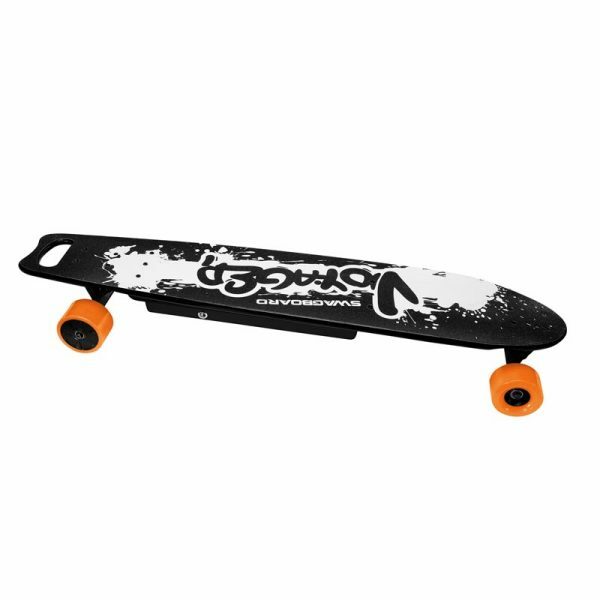 The GT Powerboard deck is 45” long and 11” wide. It’s plain as day that this thing is a HUGE monster – weighing in at 72 lbs., you can see that it’s a heavy monster, too. This monster of an eSk8 can take you 15+ miles on a single battery charge, and was built tough specifically to “mow over” dirt, snow, gravel, grass and sand. During the past few years, Boosted has earned its keep amongst one of the most household brand names of electric transportation. (With good reason, too.) 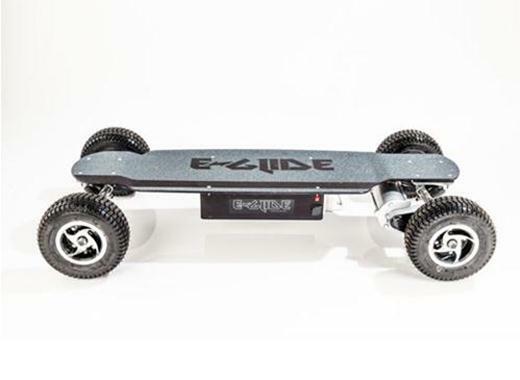 Their 2000W Dual+ e-skateboard keeps their reputation as one of the leading eSk8 manufacturers. Let’s get down to one of the main reasons you’re here: speed. The Dual+ has two riding modes: beginner, which takes you up to 11mph… and pro, speeding you past 22mph. As you’ve just read, these 5 eSk8boards were chosen for their high speeds – making them the best choices for people who love the thrill of going fast. This list is by no means exhaustive, remember, but these 5 boards are among the ones most suitable to fit your needs. It’s wise to keep in mind that how much you weigh as well as whether or not you’re riding on flat surfaces determines the true max. speeds you’ll be able to reach or not.